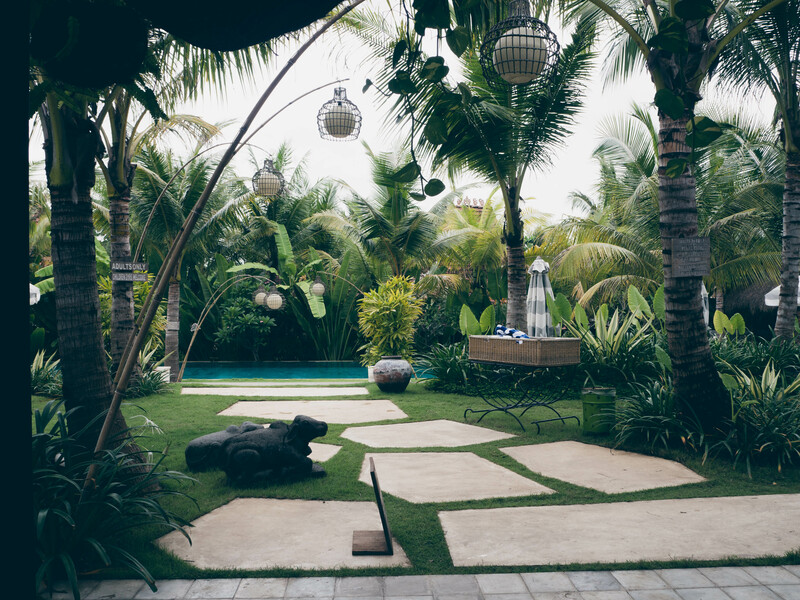 The health retreat, Hotel Komune Bali, opened its doors in Bali four years ago. 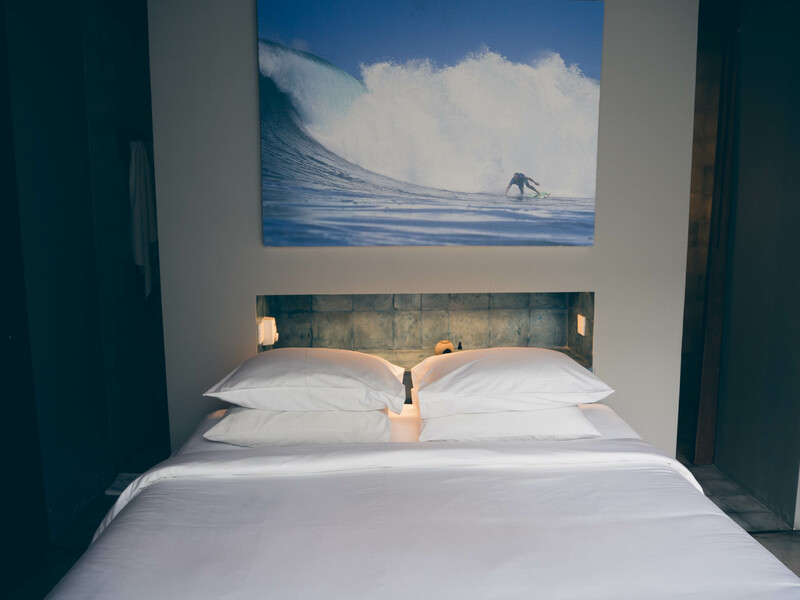 With its pristine ocean location, right on the famous Keramas surf beach, this active resort has quickly become an Aussie favourite. 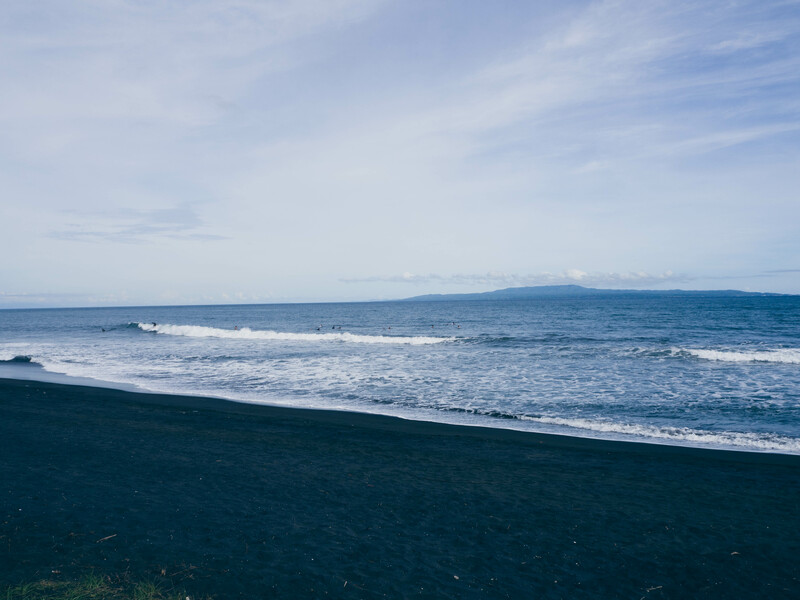 Popular among surfers, this active lifestyle resort is located on the quiet and unspoilt East Coast, which is, to many travellers, still an unknown part of Bali. 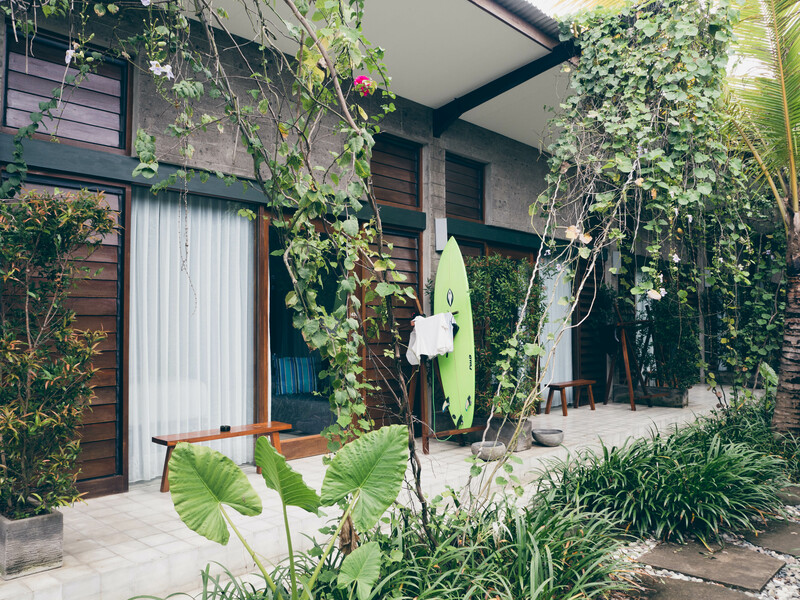 Owned by two Australians; Tony Cannon and Tony de Leede, Hotel Komune’s Bali resort offers complete rejuvenation. 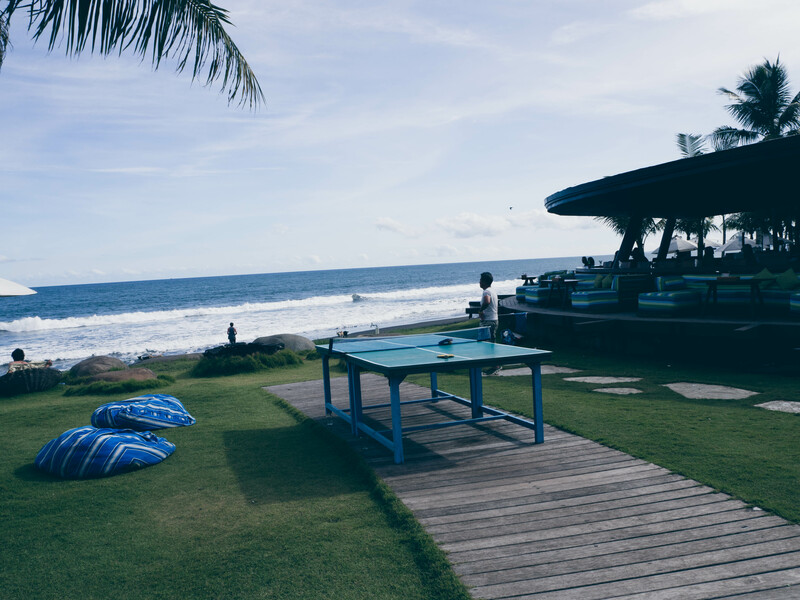 Initially, a surf resort and well-known for its night surfing program, the increasingly popular health resort recently launched additional fitness, wellness and yoga programs. The new programs are reflected in the newly opened Health Hub which was launch in late 2015 offering guests a lap pool, yoga studio, gym as well as a juice bar and a restaurant serving up healthy meals. 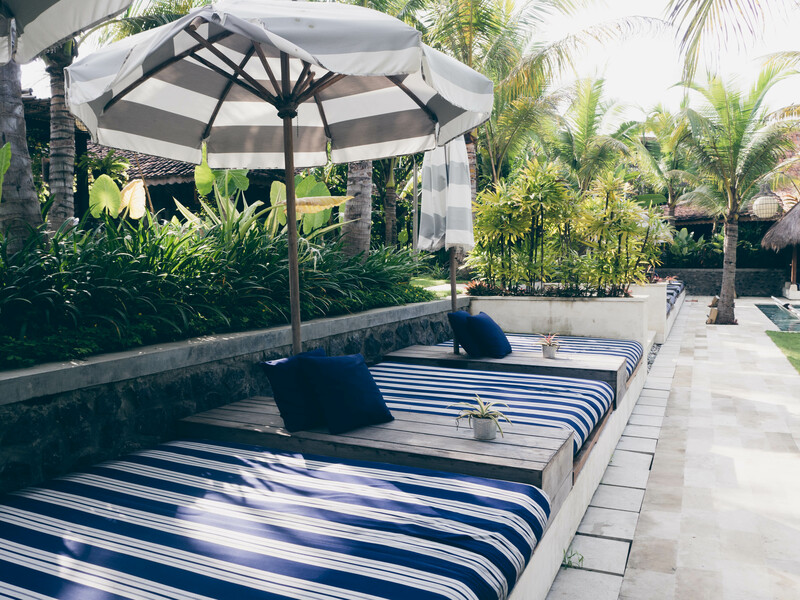 With increasing demand, the resort is looking to grow in 2017 by adding another 22 beach suites, popular among couples, to the current 22 which will add to the already exciting 56 resort rooms, 10 suites, and two villas making Hotel Komune Bali the largest resort in the area. 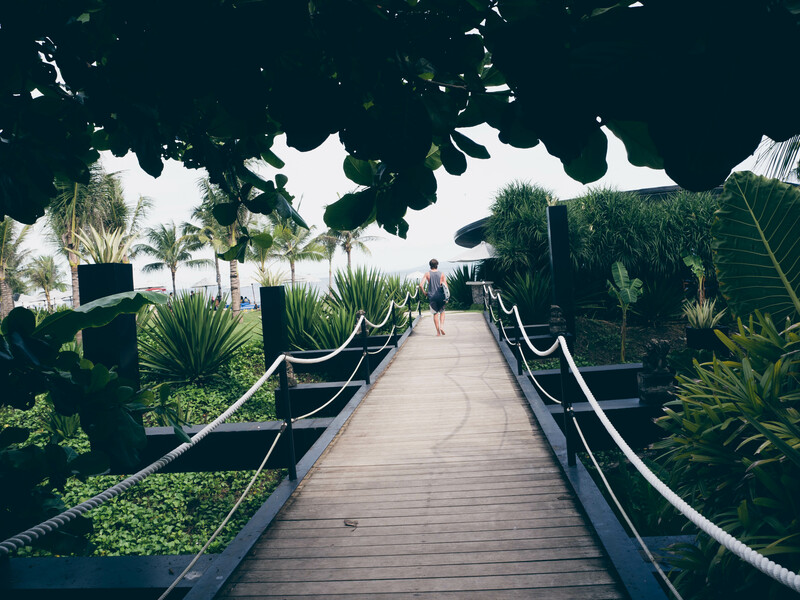 The active health resort has a real village feel with rustic stone paths crossing the organic gardens connecting the Health Hub with the reception area, the spa and the popular Beach Club situated right on the famous Keramas surf beach. 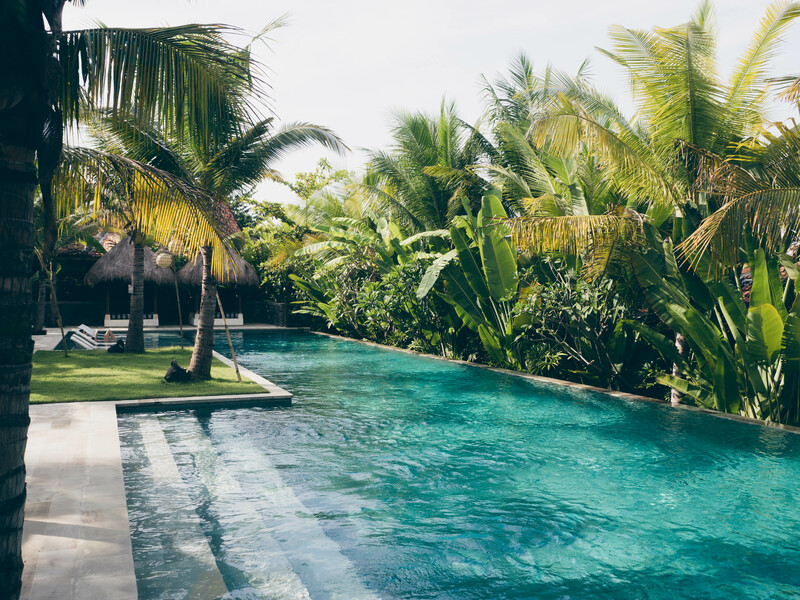 With all the amazing facilities such as the massive outdoor yoga studio, impressive gym, juice bar, healthy restaurant and the Beach Club, this is not a resort where you end up spending a lot of time in your room. However, the Resort Room is cleverly laid out with every detail being thought of. The double rooms come with a separate bathroom and shower, a comfortable double bed, a small wardrobe area, TV, a desk and a sofa, coffee and tea making facilities, free Wi-Fi and a mini-bar. 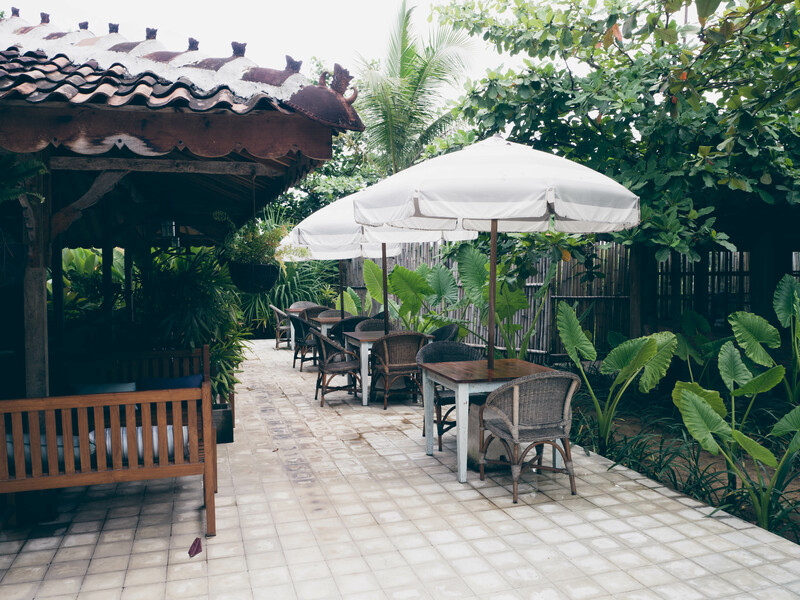 Both the Health Hub and the Beach Club offer room service. The newly opened Health Hub located next to the lap pool and the gym is the place to indulge in healthy breakfasts, lunches and dinners after workouts. 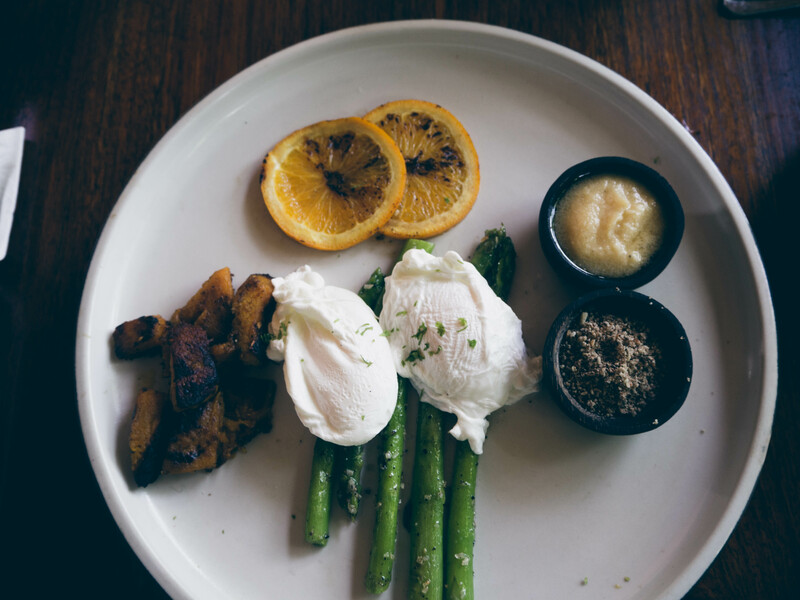 The breakfast menu is not short of healthy options such as coconut pancakes, omelettes, dragon fruit super bowl and scrambled eggs with avocado. The lunch and dinner menu is broken down into ‘Garden Harvest’, Wood Fired Oven’, ‘Ocean’, ‘Paddock 2 legs & 4 legs’ and ‘Finisher’. 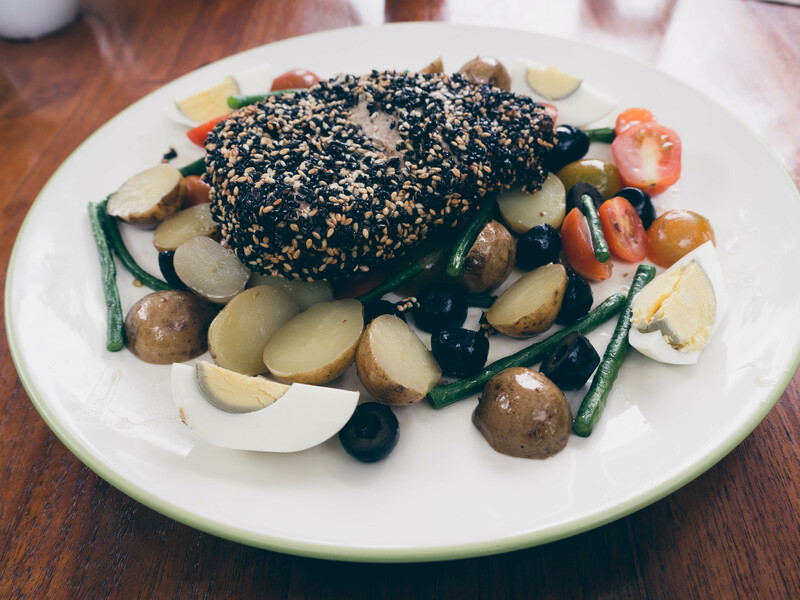 The homemade fish cakes are exquisite as well as the local sesame tuna which is served with a Nicoise salad. The stuffed sweet potatoes is another favourite which is served with fresh garden kale, ginger, lemon zest, activated seed sprinkle, cashew cheese and garlic parsley dressing. For dessert guests can enjoy almond date cake, watermelon pizza and the favourite – coconut crepes served with black rice and mango sorbet. The restaurant has its own Juice Bar serving delicious juices and smoothies complimentary with every meal. The ‘Komune Special’ (pineapple, cucumber, celery, green apple and ginger) is delicious and for a ‘sweet treat’ the ‘Mangonitas’ a fruit smoothie with mango, passionfruit (and on request blueberries) is to die for. The staff is also happy to customise any meal requests you might have. 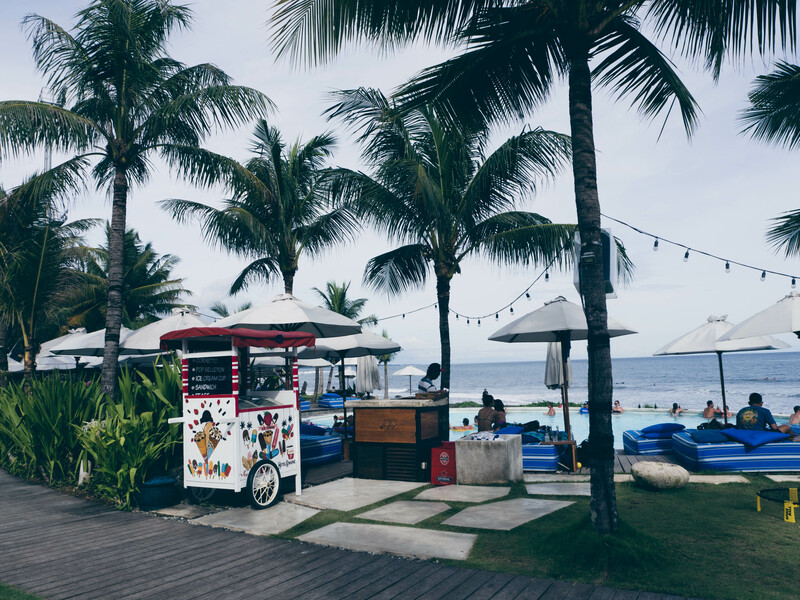 For guests who fancy an ocean view and perhaps even a couple of sneaky alcoholic beverages, the Beach Club, which was voted in the top 5 in Asia has executive chefs serving up worldwide cuisine as well as a great range of beers and cocktails. 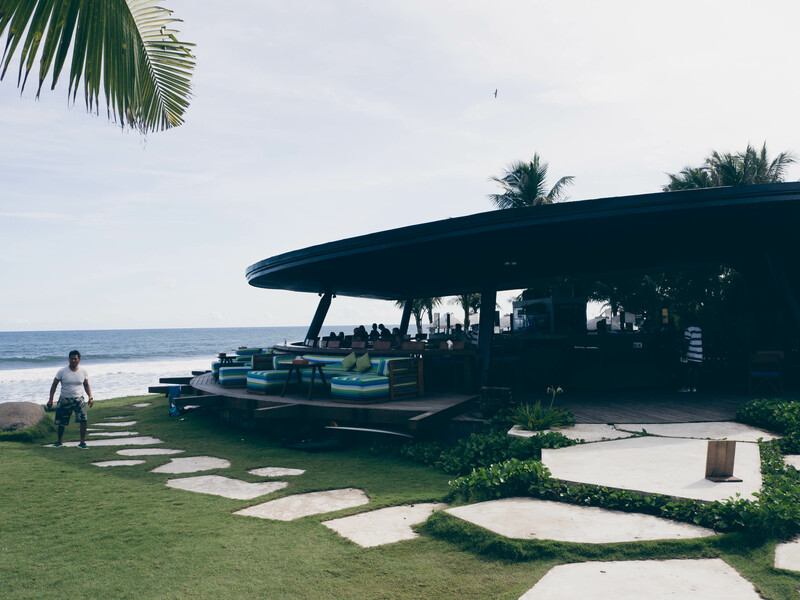 The Beach Club is also a great spot in the evening to chill out, watch the surfers in the water and listen to live music. 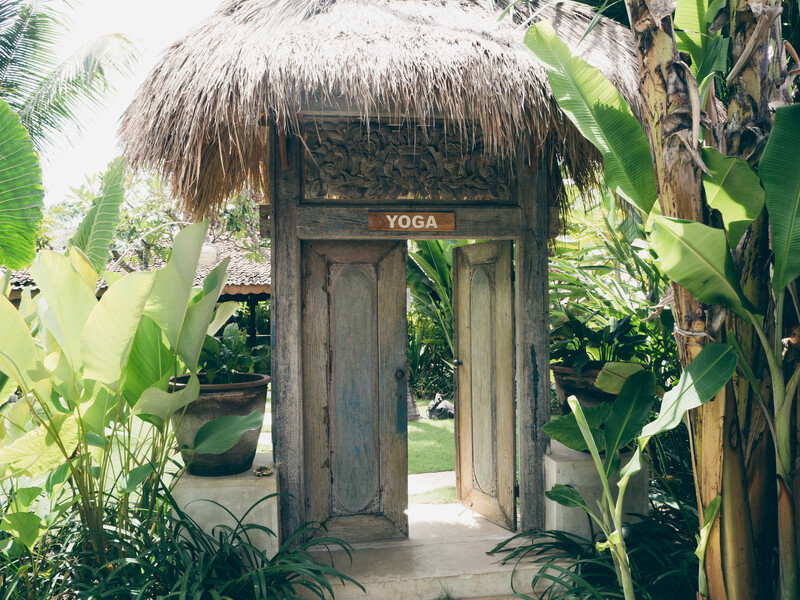 The outdoor yoga studio is spacious and offers great mats, blocks, blankets, straps and bolsters. 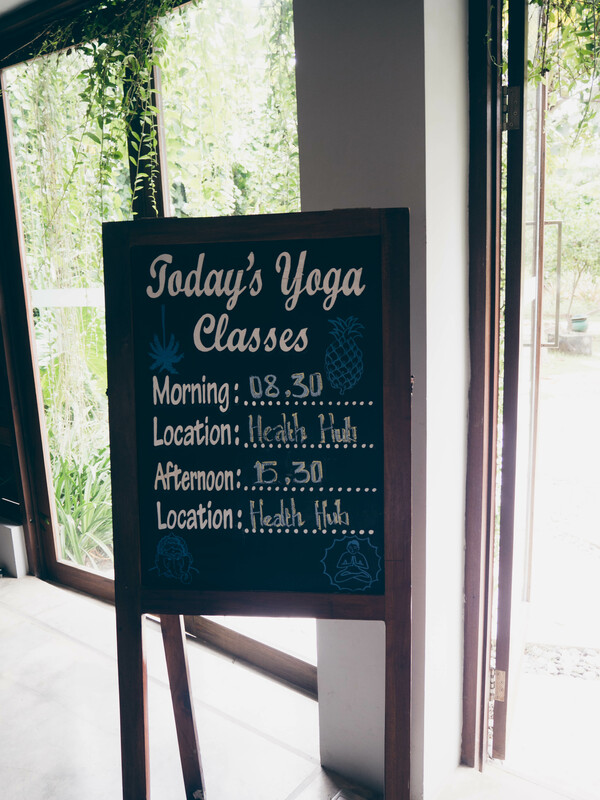 There are two daily yoga classes, a Vinyasa class in the morning at 8.30am which is a fast paced yoga style followed by a slower Yin yoga class at 3.30pm that will give the body a good stretch, offered during the weekdays by yoga teacher Nicole. 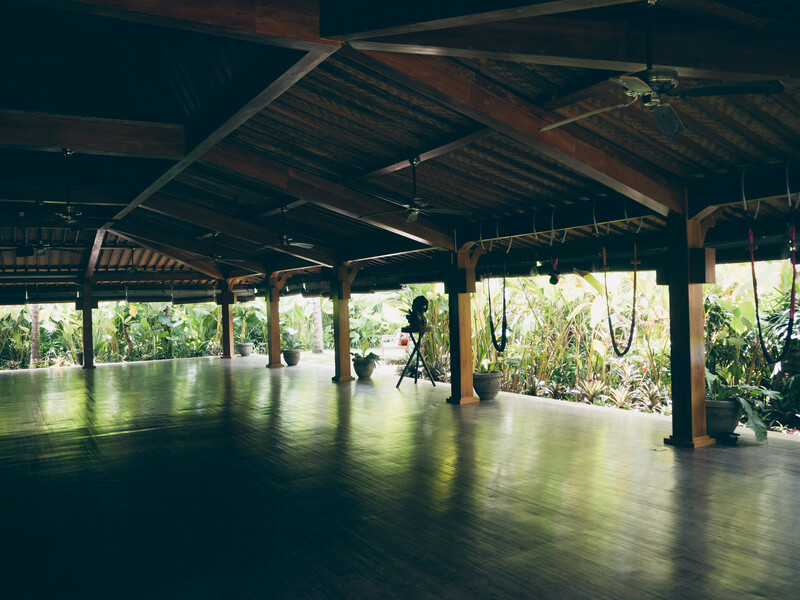 During weekends yoga teacher Sabii Ayu Jeggeg is teaching a morning and afternoon class which focuses on perfecting asanas and deep stretching. For your private yoga class, Nicole will ask you if there is anything, in particular, you would like to work on. I decided to focus on how to develop a good home practice. It is incredibly rewarding to have a private session since in contrast to a large group class Nicole watches your every move and corrects your asanas by guiding you into your poses so you can also ‘feel them’ to later replicate them on your own at home. Nicole is very approachable and after and hour of burning leg and arm muscles we discussed the benefits of meditation and pranayama and also how to develop a good yoga routine. Nicole is very encouraging and you will leave class feeling motivated about your practice. Nicole who is, apart from being a yoga teacher, also an incredibly knowledgeable Ayurveda therapists sits down with you for a couple of hours to go through the basic elements of the ancient Indian philosophy Ayurveda. She asks questions about your daily habits in detail, takes your pulse and looks at your tongue to determine which ‘dosha’ you are – Vata, Pitta or Kapha. She explains the different personality and physical traits each dosha has and suggests an eating plan based on your dosha as well as what type of exercise your body responds and benefits from the most. After a consultation, Nicole sends a detailed follow-up email summarising the session. She suggests how to incorporate changes to find the right balance for both body and mind. 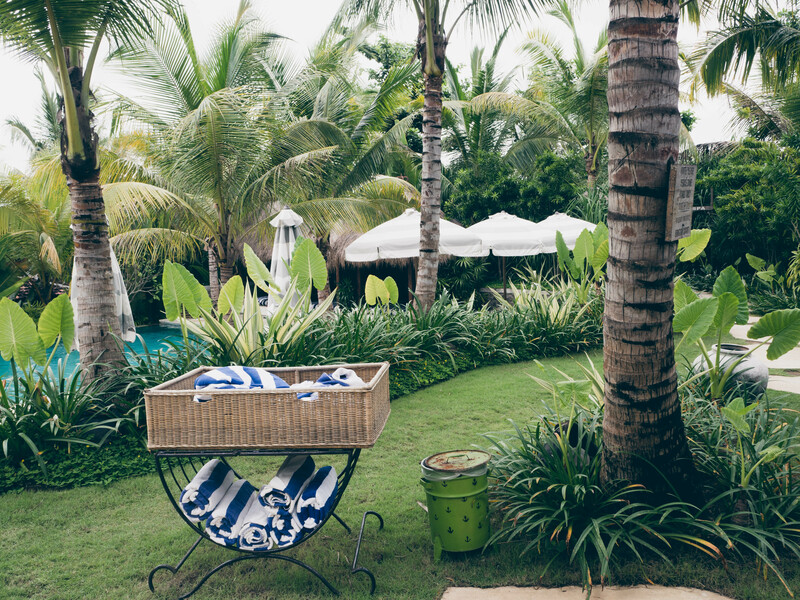 Pampering the body, after a gruelling workout, is very much one of the highlights of my stay at Hotel Komune Bali. Guests can enjoy various body massages and scrubs followed by a flower bath, facials ad reflexology. A favourite treatment was the traditional full body massage with lemongrass oil followed by a Lulur body scrub. This is a traditional Javanese beauty ritual, which effectively removes dead skin. 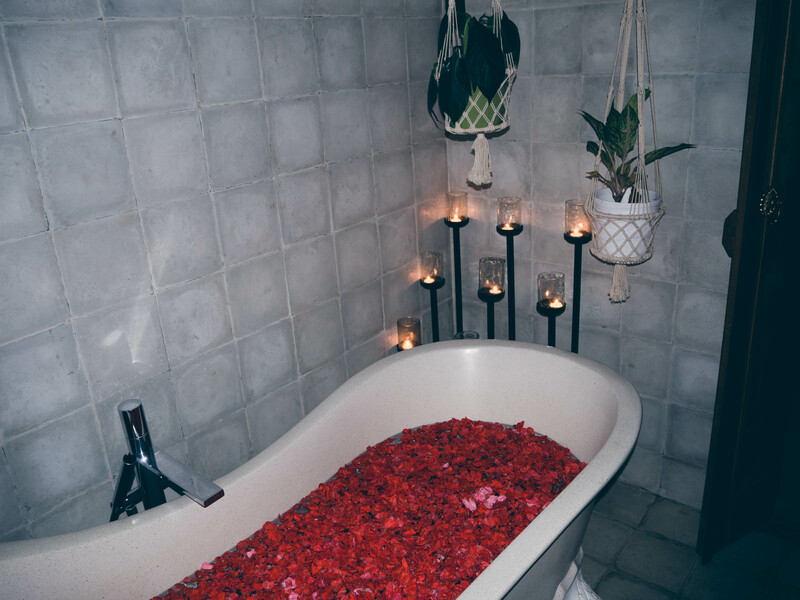 The scrub is removed in a large red flower bath whilst enjoying an ice-cold ginger tea with honey. The neck and shoulder massage is deep and powerful as well as the reflexology. The spa also offers hair and beauty treatments such as manicure, pedicure, haircuts, braiding and blow dries. 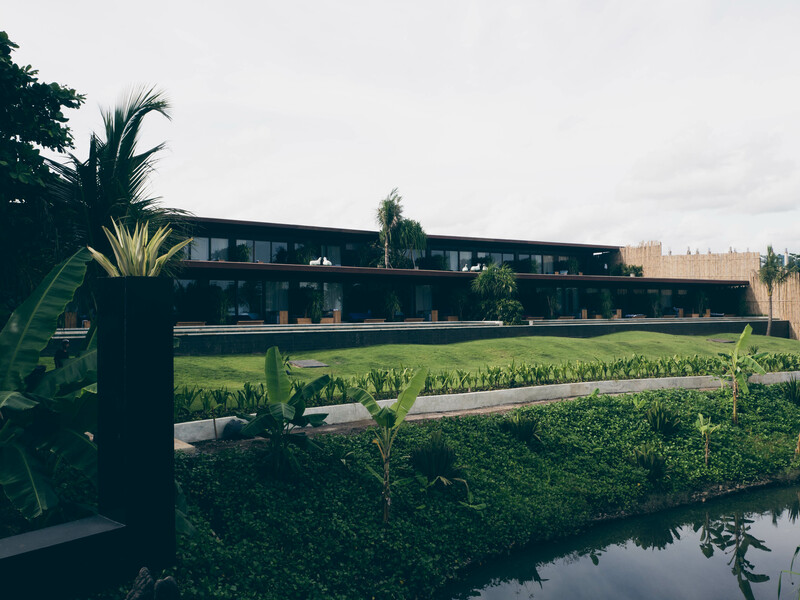 In 2017, Hotel Komune is also looking to introduce several Ayurvedic treatments to its spa menu. Would I return to Komune Beach Club? This is a lovely place for anyone looking for a week of rejuvenation. 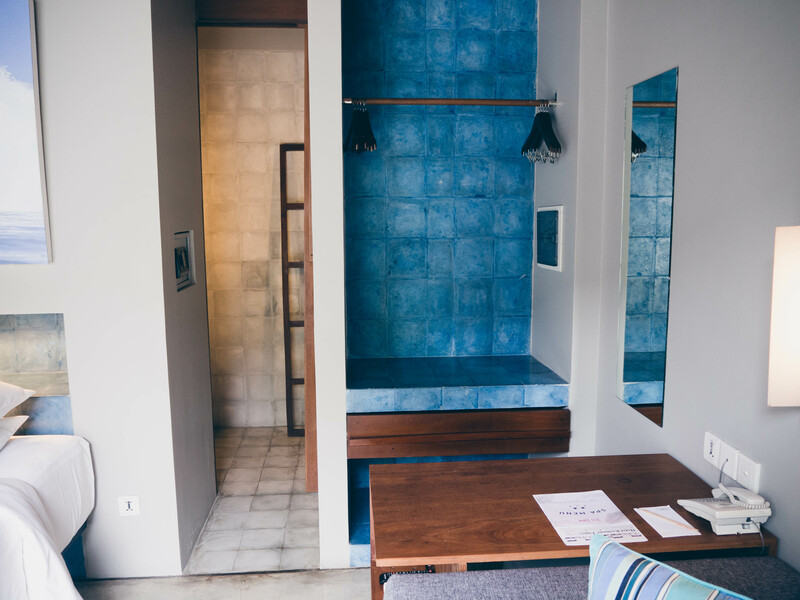 It allows guests to ‘tailor’ their own stay. 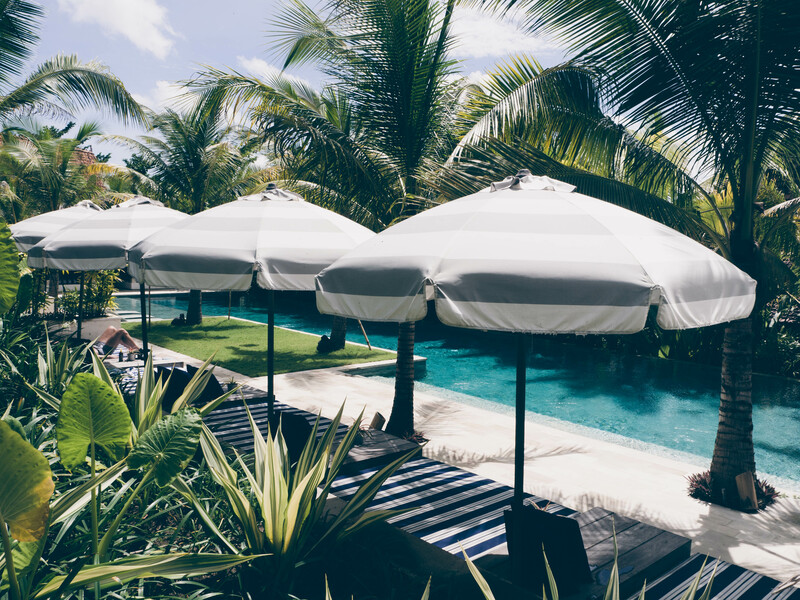 You attend your classes but you also have a lot of downtime which you can fill with spa treatments, healthy meals and relaxation at the lap pool or the pool area by the beach. By listening to your body and mind, guests are given the opportunity to create their own stay, all in a very supportive environment. Solo travellers can easily blend in with the crowd. 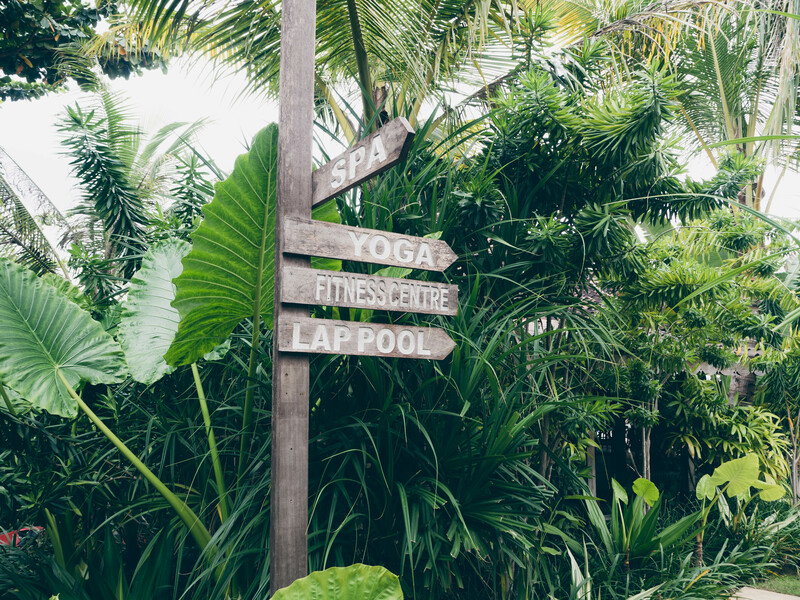 Whether it is lounging by the pool, attending fitness classes or relaxing by the Health Hub, there are plenty of activities on offer. The staff was incredibly friendly and helpful. Nothing was too difficult or impossible and the warm smiles made this stay unforgettable. Contact Health and Fitness Travel to book your active holiday. 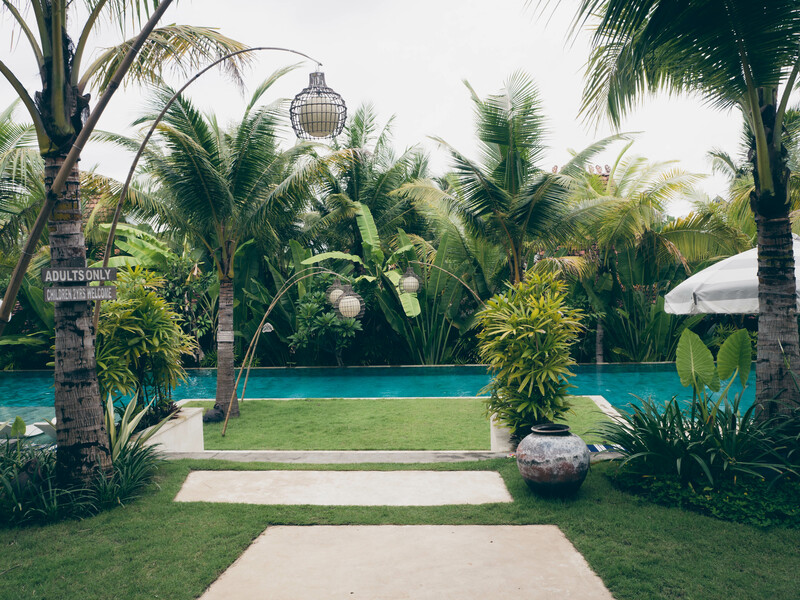 Have you seen an increasing demand for healthy holidays?